A view from pit lane at a soggy Circuit of The Americas on Saturday, Oct. 24, 2015. 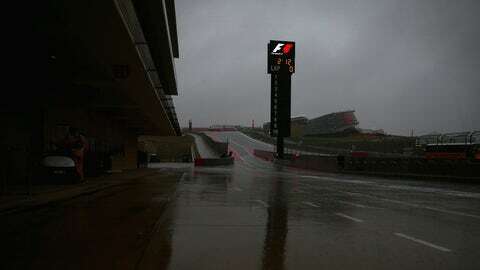 Due to heavy rain in the Austin area throughout the day on Saturday, U.S. Grand Prix qualifying has been postponed until 10:00 a.m. ET on Sunday. If there is no qualifying session Sunday morning, the likelihood is that the grid will be based on the times from FP3. Both Ferrari drivers will still have their 10-place grid penalties, regardless of the qualifying situation.